From David, public transportation is available. Take a bus or taxi and drive 37 kms toward Boquete. You will see a Terpel gas station on your right. After the gas station make the first left turn. This road is directly across from Pizzaria Salvatore. Youll see Valle Primavera located 100 meters straight ahead at the end of the road. From David to Boquete is approximetly a forty minutes ride..
GoogleMaps: Ave. A Oeste y Calle 11a Sur, Boquete, Panama Coming from David on the main road: Via Boquete turn left at Calle 11a Sur. Valle Primavera is at the end of Calle 11a Sur about 328 feet (100 meters) away. At 37 kms from David toward Boquete, You will see a TERPEL GAS STATION on YOUR RIGHT hand. After the gas station make the first left turn. This road is directly across from Pizzeria Salvatore. 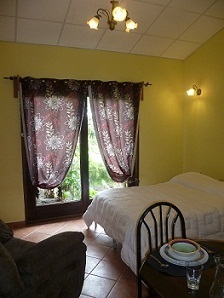 You´ll see Valle Primavera located 100 meters straight ahead at the end of the road.